The 32-year-old is now in his third season in France, where he has continued to study alongside rugby. 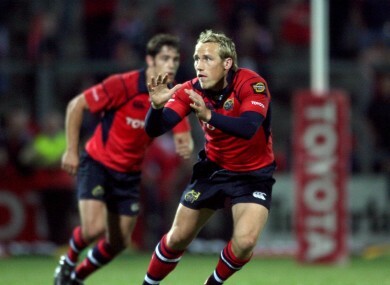 Hickey in Munster colours in 2006. VARIETY IS THE spice of life, never more obviously than in the case of Eoghan Hickey. The Dublin native’s career has seen him play for Leinster, Munster, London Irish, Worcester, Wasps, Petrarca in Italy and now Parisian-based outfit Massy. Here is a professional rugby player whose outlook on the sport is far from the norm, and wholly refreshing. The 32-year-old has made a successful passage in a game that has spat out countless victims, and his journey has largely been on his own terms. “I’ve been lucky with locations, but I’ve been quite picky with where I’ve gone,” says Hickey. “As soon as I realised, ‘I’m not going to play for the Lions,’ it partly became about where I wanted to live. “It’s not just a quest of rugby; you’ve got to look at the money, the rugby the club plays, and you want to look at the location. Ever since I accepted I’m not going to play for the Lions, I just kept on studying, getting degree after degree. Hickey is heading into his third season with Massy, a relatively long stay with one club. Despite his strong individual form, the club were relegated from the Pro D2 in the out-half’s first year in Paris, before gaining instant promotion back up from Fédérale 1 last season. The Ireland ‘A’ international moved to Massy from the “chaos” of Italian rugby, where he spent a season keeping Petrarca competitive in the Super 10 league while living close to Venice. Among Hickey’s list of academic credentials are a Bachelor of Science degree from UCD and a Master of Science degree from Brunel London, while 2015 should see him become a Master of Business Administration at the prestigious HEC Paris. Studying alongside the demands of pro rugby is something Hickey adapted to without hesitation. “It’s hard, but I think it’s just called living your life. I don’t know what person ever says their job is easy. If it is easy then it’s probably a crap job, to be perfectly honest. I just think it’s natural and normal,” says Hickey. If Felipe Contepomi can play Heineken Cup and international rugby and be studying medicine, or Jamie Roberts can play for the Lions and Wales while studying medicine, it’s not that hard for others. For now, however, the playmaker is in pre-season ahead of Massy’s return campaign in the increasingly competitive Pro D2. Having seen the success of Stade Français and Racing Métro in recent times, Massy have a five-year plan to earn Top 14 status. That means increased investment compared to their last stint in the pro leagues. “The average wages in Pro D2 can be €5,000-€6,000 a month net, with a house and a car,” explains Hickey. “It’s probably like being on around €140,000 back in Ireland on a gross level. Hickey admits to having “a love/hate relationship” with rugby, and came close to walking away from the game before joining Massy. I’ve had two surgeries on my back at this stage, so I’m not mad keen to ruin my body entirely. I finish my MBA next April, and the plan was to move into the real world without taking such a massive drop in income. “It’s a pleasure to play rugby and I feel lucky doing it, but it’s just a means to pay for my life at the moment. I’m not in France to play rugby per se; I’m actually in France to do my MBA and rugby pays for it. Email “Ex-Munster out-half Hickey a Master of the professional game”. Feedback on “Ex-Munster out-half Hickey a Master of the professional game”.